Iron Maiden Series, Drum Set from Premier. 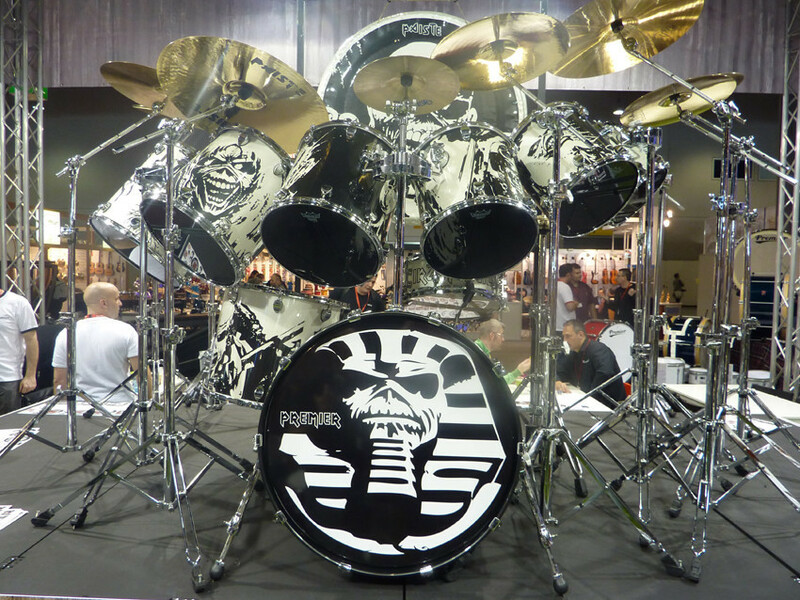 One of the biggest drum announcements of the show came from Premier drums, and Iron Maiden drummer Nicko McBrain. More details will be coming soon, but basically Premier has agreed to a worldwide licensing deal to release several drum kits, snares and more with custom Iron Maiden artwork, in association with Nicko McBrain. According to the company, some of these replica sets will come at an affordable price by Premier's standards. [Musikmesse] Pearl Daniel Erlandsson Snare Arch Enemy sticksman Daniel Erlandsson gets his own Snare Drum model. [Musikmesse] Pearl Throne Thumper Pearl partnered with ButtKicker to develop a "low-end feel machine" that attaches directly under any throne. [Musikmesse] Pearl Roadster Throne Pearl introduces a new Roadster Throne line up with improved new features.